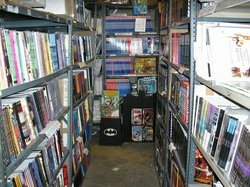 A “Secret” Bookstore in Brooklyn, And a Black Friday, And a December 5-6 Sale! By James H. Burns: Can there be a secret bookstore? One with over 40,000 volumes, many at a buck a piece? And with over one million comic books? And magazines, and games, and toys….? And just oodles of items that would tickle the fancy of any genre fan? 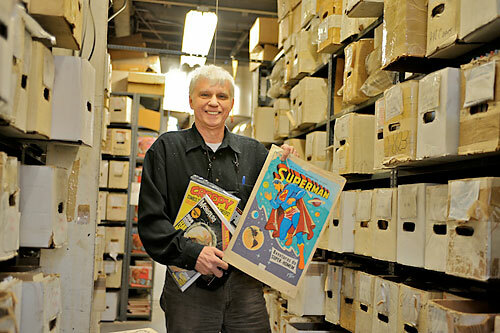 Joe Koch has been an active bookseller for over forty years, and his ads in the collectors/traders of the late 1980s and for years thereafter, were a cornucopia of the best of comics, and science fiction, and fantasy film magazines. Is open to anyone, at any time, by appointment. It’s like walking into a convention out of time. Exactly like the best of convention dealers rooms, of another era, with treasures and smiles peeking out at every corner, with so many boxes and displays to go through, and admire! The journey to Brooklyn — if this seems appealing! — is well worth the effort. Koch is having a Black Friday sale tomorrow, taking twenty percent off the already low prices. Next weekend, on December 5th and 6th, the shop is having another weekend blowout, with free goodies and treats for all who attend! There’s one other intriguing facet. Working with Koch are at least a couple of folks that you might well recognize from the heyday of the New York convention scene, decades ago. Can time be preserved on the second floor of a building just blocks from the waters of Gowanus Bay? Can all these wonderful old publications, and the folks who cherish them, project some kind of fluid, quantum bubble? And, I believe, it’s worth the time to find out! 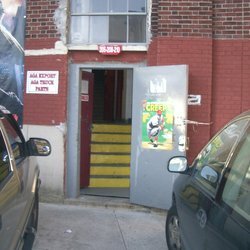 Driving there is easy, to the destination at 41st and First Avenue in Brooklyn, just a block from the Gowanus. By subway, the trick is to take the D,N or R train to 36th and 4th (shortly from the Barclay’s Center/Atlantic Terminal, coming from Manhattan), walk the five blocks to 41st, hang a right, and walk the short distance to 206 41st Street…. Joe is an old friend, and on Friday, and next weekend, I’ll also be there to say Hello! This entry was posted in Like Show Business and tagged James H. Burns, Phil Koch by Mike Glyer. Bookmark the permalink. OK, that’s downright cool. Thank you for writing this up! So for those thinking of taking the subway this inn of wonders (! ), please stay with the D or N trains! Went there. James was cool and helpful, and the place was amazing and labyrinthine, with piles of treasure stacked wildly on shelves as you round multiple corners, comics, books, toys from all fandoms, record albums – I half expected to find a weensy door hidden in a corner that led to the Queen of Hearts’ croquet party or John Malkovich’s brain. Awesome. Glad to hear you had a great visit. This is nowhere near the Gowanus Canal, but two blocks from the Gowanus Expressway, aka I-278, which runs above Third Avenue in Brooklyn. Ironically, Ted White used to live nearby, at 339 49th Street, before he moved back to Virginia in the 1970s. And they’re talking about 41st Street and First Avenue in Brooklyn. You MISSED the door to the croquet party? All you had to do was ask! It was delightful meeting, amid the aisles!